Q. 01: What is the total flight distance of the Hayabusa2? A. 01: When we consider the flight distance from when the Hayabusa2 leaves the Earth on Nov. 30, 2014, to its return to the Earth at the end of 2020 based on the heliocentric coordinates, the total flight distance is about 5.24 billion kilometers. However, this distance does not mean much, because flight distance in space is different from the driving distance of a car on the Earth. In addition, when you talk about the distance, the coordinate system also plays an important role. The aforementioned distance is based on a coordinate system that calculates the flight distance on the assumption that the Sun does not move. Actually, the Sun travels at 220 km per second around the center of the galactic system. In addition, the galactic system itself also moves in space. Therefore, the Hayabusa2’s flight distance varies depending on what coordinate system is applied. Q. 02: Why does the Hayabusa2 require only one year to come home although it takes three and a half years for its outbound trip from Earth to the asteroid? A. 02: After its launch at the end of 2014, the Hayabusa2 will fly on a similar orbit as the Earth to make one circle around the Sun. Then, after about one year, it comes back near the Earth to perform a swing-by at the end of 2015. In other words, the actual time duration for the Hayabusa2 to arrive at the asteroid from the Earth is about two and a half years. The first one year until performing a swing-by is an important period for checking the onboard ion engines through trial operations and inspecting onboard instruments. So why is the outbound trip two and a half years whereas the inbound is only one year? This difference is based on the consideration on the required speed to arrive at the destination. The final destination of the outbound trip is the asteroid 1999 JU3. When the Hayabusa2 comes closer to 1999 JU3, the explorer has to reduce its speed to the same as the asteroid’s to conduct a “rendezvous navigation.” In the case of the Hayabusa2’s ion engine, it cannot change its speed or orbit on short notice, thus it requires some time to control the speed. On the other hand, the goal of the inbound trip is the Earth, and the Hayabusa2 will “just stop by at the Earth to deliver the capsule”, then will fly back to deep space. Thus it does not have to speed down to match the Earth’s speed. The required travel time depends on the relative location of the Earth and the asteroid, which fluctuates from time to time. Luckily, the relative position is quite favorable for the scheduled inbound trip this time. Q. 03: The predecessor Hayabusa was renowned for its big parabolic antennas. Why was the design changed to two flat antennas for the Hayabusa2? A. 03: The Hayabusa2’s two round flat antennas are high-gain antennas. They are used for sending a large amount of data. The Hayabusa2 is also equipped with a mid-gain antenna and low-gain antenna. The high-gain antenna’s diameter is 90 cm, twice the diameter of a standard CS parabolic antenna for households. The Hayabusa2 is equipped with two high-gain antennas as it uses two kinds of radio waves, namely X-band and Ka-band, which have two different frequencies. The frequency of the X-band is about 8 GHz, while that of the Ka-band is about 32 GHz, thus the Ka-band is four times faster (or the volume of data transmission is four times larger over the same duration of time.) Hence the Ka-band antenna will be used when the Hayabusa2 arrives at the asteroid and send a large amount of data after making plenty of observations. So why are they “flat” antennas? This is because a flat antenna can perform to the same capacity as a parabolic antenna due to technological improvements. Thanks to the flat design, the weight of the antenna is reduced to one fourth compared to a parabolic antenna whose performance is the same. A lighter antenna is better for a space explorer, thus the flat one is preferable. In addition, it is less easily heated than a parabolic antenna. 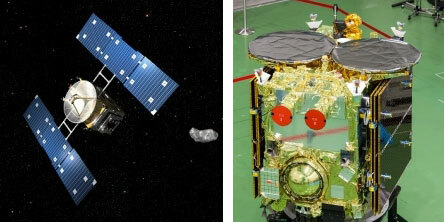 Japan’s asteroid exploration missions have used flat high-gain antennas since the Venus Climate Orbiter “AKATSUKI” mission launched in 2010.